Nobody I know works around their barnyard in nice leather jackets, and a chicken is not an accessory. 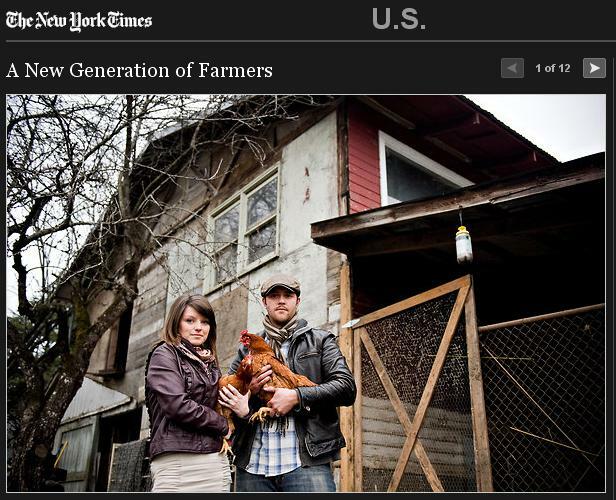 Nothing against the folks that are the subject of the article, but to me it looks like the paper sent the style page photographer, who was more interested in catering to the frustrated fantasies of NYC hipsters than in making an accurate portrayal of small farming today. The article was short on practical detail, too – what are they growing, on how many acres, and can they net enough to live on? This entry was posted on March 22, 2011 at 6:50 am and is filed under agriculture, rant. You can follow any responses to this entry through the RSS 2.0 feed. You can leave a response, or trackback from your own site.